This versatile two-way rolling retail display rack features combination of waterfall and straight display arms that are height adjustable. The slated arm features 7 retaining studs and the straight arms is 16” long, both with have push-button height adjustability. The adjustable arm’s height is 54” from the ground, and it adjusts up to 75” from the ground. 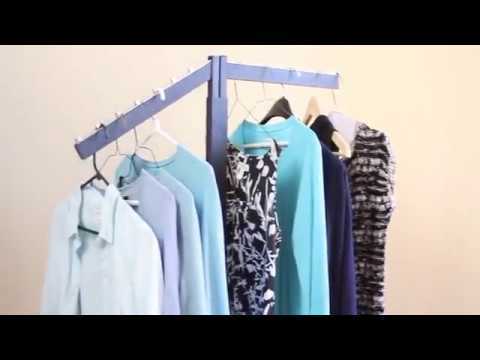 The ability to adjust the height of the arm gives this two-way rolling rack versatility to display a range of different size garments such as t-shirts or long dresses. Four rolling casters, 2 of them locking in place manually. The 2-way rack is very easy to move around the showroom floor even when fully loaded. The combination of a slanted and straight arm on a single 2-way rack allows for a range of different display setups. Slanted arms are commonly used to display different color variation and styles clothing where the straight arms are used to store and display a variety of different sizes.